The 2019 Jaguar I-PACE all-electric SUV is finally here. Contrary to what others might say, the I-PACE is not primarily designed and engineered to dethrone the capacious Tesla Model X. Instead, Jaguar’s first fully-electric car will stay true to the old Jaguar credo of space, pace, and grace, only now the ‘pace’ part is motivated, not by a supercharged V8, but by a pair of powerful electric motors. They’re of Jaguar’s own design, with one motor for the front and one for the rear of the car. Each features independent torque control, and can work independently given the current driving situation. All of this is controlled by the Jaguar Intelligent Driveline Dynamics software in the background, and each motor and transmission weighs just 78kg (172 lbs.) to keep the SUV as nimble as possible. Equally important is the 90 kilowatt hour battery pack, comprised of 432 lithium-ion pouch cells. Jaguar says that the I-PACE’s packs use the most energy-dense battery chemistry on the market today, though what you really need to know is the power they put down to the road. 394 horsepower (400ps), to be specific, and a health 512 lb-ft of torque (696Nm). It means that, despite the I-PACE being no particular lightweight at 2,193kg (4,784 lbs. ), the electric motors can propel the car from 0 to 60 mph in 4.5 seconds. The sprint from 0 to 100 mph can be achieved in as little as 4.8 seconds. Sure, that may not make it the fastest-accelerating gasoline or electric SUV, but it can definitely hold it’s own against modern sports car. More controversial, though, is the styling. As with any EV, aerodynamics play a huge part in how the I-PACE ended up looking, though I’m pleased to say it hasn’t ended up overly-smoothed and anodyne (or, for that matter, like a Prius with British badging). The front and rear overhangs are kept as short as possible, with the majority of the car’s length going into the 2,990mm wheelbase. It pays dividends inside: the combination of the cab-forward design, sweeping coupe-like roofline – merrily airy with its full glass roof – and squared-off rear contribute to a spacious cabin that spoils its five occupants. In fact, you get over 40-inches of legroom in the front, and 35-inches in the rear. Trunk space is an impressive 656 liters, or 25.3 cubic-feet; fold down the rear seats, and you have 1,453 liters (51 cubic-feet) of storage space to play with. There’s even a small boot in the front – that Jaguar affectionately calls the ‘froot’ – which adds 27-liters more storage space under the hood. Altogether, it leaves the I-PACE one of the most practical cars you can buy today. Callum is, clearly, biased. All the same, the I-PACE’s fusion of elements borrowed from hatchback, sports car, and crossover SUVs is undeniably distinctive. I can quite understand that, for some, the design might be a little too polarizing, particularly how the smooth and flowing front design is combined with the rather unusual squared-off rear. Looks, though, can be subjective (not to mention highly color-dependent) and, though the I-PACE may not set standards in automotive beauty, I’d argue its design is a welcome respite from the stereotypical styling of most modern crossovers and SUVs. Jaguar has come up with a car that manages to stand out, without looking like a weird – and contrived – otherworldly EV. That polish continues with the cabin finish. For the 2019 I-PACE, Jaguar rolled out its fine contrast twin-needle stitching, white LED illumination, and pleasingly authentic trim. The twin touchscreen infotainment system familiar from the Velar has been carried over, seamlessly blending touch and physical controls. For its EV, Jaguar has mounted them on a floating center console with a unique cantilevered design. The upper screen handles navigation and multimedia, while the lower display takes care of HVAC, the power seats, and other settings. The standard sports seats feature heating and cooling, and you can have the whole HVAC system activate automatically on a schedule while the I-PACE is still charging, so as to save as much battery power as possible for the road. Acoustically laminated front side glass and full-frame doors help keep things quiet, too. Only the thrum of the rather silly Active Sound Design system – that mimics some mangled soundtrack vaguely reminiscent of a gas engine as you hit the accelerator – can be heard amid the tire noise. Turn the fake noise off, though, and you can revel in the majestic silence that only a full EV can provide. Unlike Tesla’s strategy, offering the Model X in three different versions depending on the capacity of the battery pack, Jaguar initially has just one I-PACE model so as to make things simple for the potential customer. Range certainly isn’t an issue, given the I-PACE can run for 480km or roughly 240 miles on a single charge. At the other end, a 100 kW DC fast charger can take the battery to 80-percent in 40 minutes. A Level 2 charger would take 10 around hours. While big cats may prefer the juiciest meal in the wild, they’ll not turn their noses up at what’s available if only scavenged fare is on the menu, and the I-PACE is no different. A state-of-the-art heat pump and heat exchanger system can convert thermal energy to power, for instance, charging the battery from waste heat. According to Jaguar, the system can convert 1 kWh of heat to 2.5kWh of electrical energy, in the process adding up to 50+ kilometers – or around 31 miles – of range. You don’t need to be toasting in the Serengeti to get the benefit, either: it’ll apparently work even in extremely cold weather conditions, and can even harness the waste heat produced by the battery pack itself. More familiar from EVs, meanwhile, is regenerative braking. Here, the 2019 I-PACE offers a two-stage system: the highest setting can slow down and bring the SUV to a complete stop, just while lifting off the accelerator, converting that momentum into battery charge. It works well, too, even though I found the pedal-feel to be softer than in other electric cars. As you’d expect, the 90 kWh battery is sandwiched neatly into the floor plan, and Jaguar makes it an integral part of the chassis in the I-PACE. The unexpected benefit is that, unlike the F-PACE – Jaguar’s gasoline SUV – the electric car has a lower center of gravity, in addition to a 50:50 front to rear weight balance. The automaker claims the I-PACE has the stiffest body structure in its history of production cars, too, and it also happens to be the most aluminum-extensive Jaguar to date. The frame is comprised of 94-percent aluminum components, while the aluminum suspension gets dual wishbones in the front and a modified version of the F-PACE’s integral link set-up at the rear. Air suspension is standard, and can adjust the ride height by 2-inches in off-road mode, or lower it by 1.6-inches to make getting in and out more comfortable. Push the I-PACE above 65 mph, meanwhile, and it can drop down even further, automatically shifting its stance 0-4-inches lower to improve high-speed stability and aerodynamics. Honestly, this is the part where the I-PACE really started to impress me. For the most part, new car drive programs consist of some form of on-road driving, and then – depending on the type of vehicle – some sort of dynamic activity that the automaker hopes will showcase its “special sauce.” If you’re in a performance car, that probably means the track; for an off-roader, there might be a muddy course to scrub through. Jaguar, though, included not only both of those, but more again. Places, in fact, I’m not sure Tesla’s Model X warranty could withstand. 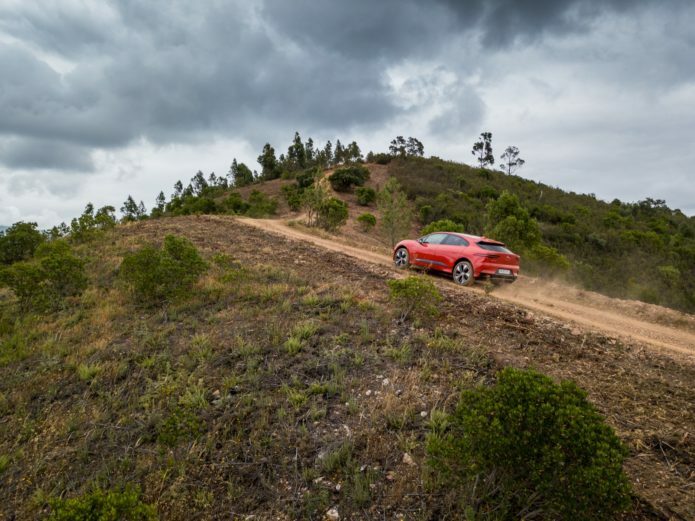 It may be all-wheel drive, but the off-road course Jaguar had set up for the I-PACE was, frankly, not something I’d dare to take the car through, were it my name on the lease anyway. Jaguar’s faith is contagious, however, and so I pointed the EV at knee-deep water, mixed in with navigating what, I’d estimate, were 37-40 degree gradients, not to mention some truly rough terrain. Consider me properly impressed. On more typical roads, meanwhile, the 2019 I-PACE is surprisingly light, easy, and nimble to drive. It’s quick to pick up, yes, though it doesn’t feel as exciting – or as terrifying – as the Tesla Model X in full Ludicrous mode. The air suspension-cushioned ride is as graceful as you’d expect from a “proper” Jaguar, though keen drivers will still notice the heft of the vehicle when it’s driven aggressively. The real selling point of an EV from an enthusiast’s point of view, though, isn’t the practicality nor the luxurious interior: it’s the pure, unadulterated rush of torque from the moment you step on the pedal. Here, the 2019 Jaguar I-PACE will happily oblige. Handed the key fob for an I-PACE S and pointed in the direction of a race track, it was time to see whether Jaguar’s sporting ambitions had been preserved, even if the hydrocarbons had been left behind. Tracking an electric car can, as many Tesla owners have discovered, be a short-lived affair. Systems designed to keep cool during on-road use – particularly regenerative brakes – can quickly find themselves getting uncomfortably toasty when pushed considerably harder on a race course. Now, I’ve driven this Algarve track a number of times, including in some serious performance metal like the recent Aston Martin Vantage. I felt little compunction about pushing the I-PACE harder than I normally would, then. The most challenging part of the course is its drastic changes in elevation. For gasoline cars, getting on the throttle and opening up whatever reserves of power you have can be tough, but not so in the I-PACE. Indeed, there’s so much torque that, after my second run, my right shoulder was aching from grabbing on to the steering wheel so tightly. Straight line speed is one thing, but the I-PACE S’ 20-inch wheels proved more than sufficient when it came to grip in the corners. That’s not to say there’s no room for something more frisky. Hug the last wide-right-hander turn at higher speed, and you can kick out the rear for a little sideways action, feeding you neatly into the front straight where it’s full throttle once again. What rapidly grew to be addictive is how the EV features contribute to the driving experience, rather than simply mimicking that of a gas vehicle. Coming toward the end of the front straight, for instance, the braking point is on a downhill slope that feeds right into a fast triple apex. With the I-PACE you need barely lift off, allowing the electric SUV to settle and the regeneration to kick in. Add a little extra braking, just the slightest of taps, and you’re perfectly set up for the three quick turns. Final challenge of the day was some impromptu rallying. Again, hardly the sort of activity you’d expect a comfortable electric SUV to undertake but, just like everywhere else, the I-PACE delivered the good. The same Sport mode that had delivered accurate and fast handling on the track saw the Jaguar turn itself into a rally car. Out on the dirt roads, the steering wheel gets much looser, letting you flick the EV’s weight from side to side to swing it around tight turns. All too often, electrification can feel like compromise. Sacrifice the emotional engagement of an internal-combustion vehicle, in the name of environmental friendliness or practicality. Not so the 2019 I-PACE, though: rather than mimicking a gas SUV, or retrofitting a crossover in an attempt to score some green points, Jaguar has created a car that revels in its electric underpinnings. It is, I say with no exaggeration, a game-changer for the luxury electric vehicle segment. That Jaguar has nailed it in a way that’s so pitch-perfect on its very first attempt, too, deserves some serious kudos. Audi, BMW, Mercedes-Benz, and yes, Tesla too, consider yourselves put on notice. The 2019 Jaguar I-PACE is out to win hearts and minds, and I’ve zero doubts this zero-emissions SUV is capable of it.